Here on Top Off My Coffee I regularly compare top of the line products, which are somewhat similar, against each other to decipher the pros and cons of buying each one. In general all products compared and reviewed are excellent products by all accounts but one maybe better for certain people over others. 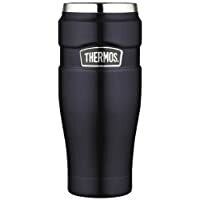 Today I’ll be looking at two high end travel mugs by Thermos. First of all you should know that both the Stainless King and the Sipp are worth every penny and nothing is inherently bad about either of them. Having said that they both have points that may make them better for certain people. Lets explore. Before we explore which mug is best for which people lets just say this. They both utilize the same vacuum double wall insulation technology (an airless space between two stainless steel walls) and as a result they are both equally good at retaining heat for the better part of an entire day. Likewise they both are made from essentially unbreakable stainless steel on the inside and outside. They are built to last years with no diminishing performance. Both mugs are also leak proof when placed in the closed position although keeping the lid parts clean is the only way to ensure the mug remains leak proof for years to come. As coffee residue gets under the rubber gaskets and threads small leaks can develop. Cleaning these small parts routinely eliminates this possibility. Here is a video demonstrating how to clean the Stainless King. Here is a video the Sipp – the lid is broken down toward the end. Both mugs make the cleaning very easy too as the lids can be completely disassembled on both. If you drink your coffee with milk then this is an even better selling point that other brands which aren’t as easy to clean. Another similarity is a tea hook for the tea drinkers of the world. Both the Thermos Sipp and Stainless King give you a nice little hook to dangle your tea bag or tea basket from. Generally speaking the quality of these two mugs are just about unbeatable. Read on for more on differences and how to choose between the two insulated tumblers. People who use the mug in the car will appreciate the design of the Sipp’s lid over that of the Stainless King as it doesn’t have a dedicated drinking hole – it’s essentially a 360 degree drinking spout which can help keep you safer. If you hate having to use two hands to open and close the lid then you’ll like the Sipp. It has a push button open close feature built into the lid compared to a turning mechanism on the Stainless King. If you need a mug that doesn’t stand as tall then you have to go with the Stainless King. The Sipp is noticeably taller than most 16oz tumblers and is also more likely to tip over unless in a cup holder. If you hate drinking off of a plastic lip then you have to buy the Stainless King. I’m in this camp and I greatly prefer the Stainless King because of the stainless drinking lip. Big plus in my book. If you value aesthetics then you should not get the Stainless King. Although peeling of the colored finish is rare it can happen – especially in cases of running it through the dishwasher. The Sipp on the other hand can be purchased with a basic stainless steel finish that hasn’t had issues with peeling. People who hate hand-washing will do better with the Stainless King. Although both mugs are vacuum insulated the Stainless King will do better with an occasional dishwasher run so long as you don’t mind eventual peeling of the colored exterior. 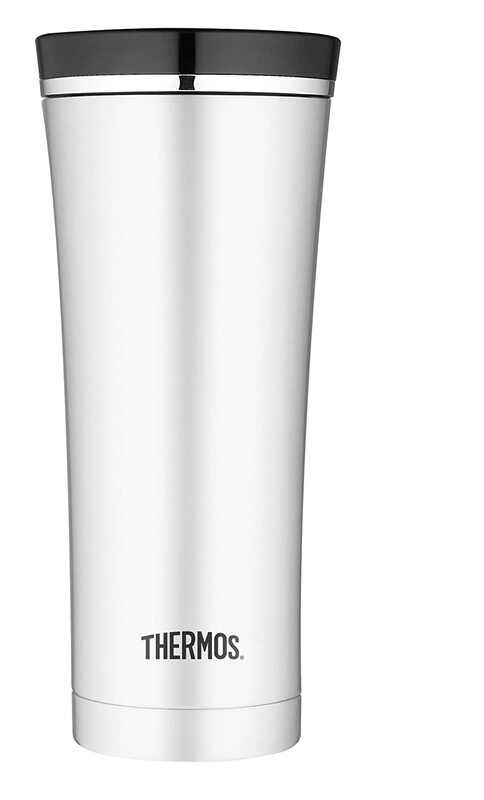 Generally speaking the Thermos Stainless King and the Thermos Sipp are almost identical. They look a bit different and their lids operate differently. If you want a push button open/close function then you have to get the Sipp. If you like the durability of the time tested twist seal then you should buy the Stainless King. The King comes in a more standard dimension which is something I like although both fit cup holders just fine. The Stainless King can be placed in the dishwasher but you may end up with a peeling exterior color if you do this too often. In my opinion they are both equals but I like the look of the King and I prefer the lid of the King as well. It’s why I bought it but there are unique features of the Sipp which would stand out to many out there. If you have any reservations then I recommend flipping a coin to decide which to buy as you’ll be happy with either – no doubt. You can also see a lit of the best travel mugs featured on this site by clicking this link.